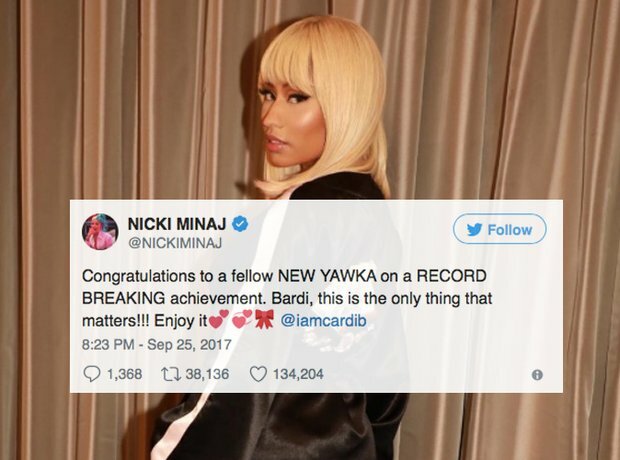 After 'Bodak Yellow' hit the number one spot, Nicki took no time in congratulating Cardi. 10. After 'Bodak Yellow' hit the number one spot, Nicki took no time in congratulating Cardi. "This is the only thing that matters!!! Enjoy it" Nicki wrote. Cari responded to the rapstress's tweet, thanking her and telling her "This means sooo much coming from you!"